We all, okay, at least a lot of us use credit cards and I'm assuming most of us know how it is beneficial. It is so much more convenient to pay bills, buy goods, convert large purchases to EMIs etc. all on credit - money that's loaned to us. And most credit cards offer a 52 day or so rolling credit. What this essentially means is that the bank is offering you an interest free loan for 52 days. Of course, that doesn't actually translate to 52 days if you make your purchase on the last day of your billing cycle, but if you do schedule your purchases during the first 15 days of your billing cycle, it offers quite an opportunity to not only save money but earn more out of it. Let us assume you get your salary on the first day of the month. Now, let us assume that your credit card billing cycle is from the 11th of the current month to the 10th of the next month. This means that you receive your credit card bill on the 10th of every month and the due date for which (assuming a 52 day rolling credit) is 30th of every month. This being the case, you have money lying in your savings bank account earning a measly 4% (average SB interest rates in most banks today) until you pay off your card. Obviously, paying off your Credit card bill immediately is foolish. Even if that money sits in a regular savings bank account, it is earning interest for you, albeit at a lower interest than it can. So, ideally, the best thing would be to pay off your card 3-4 days before the last day, because the transaction takes 3 days to get processed and hence, this would make sure that it gets processed before the due date and you aren't held responsible if there's a delay in processing because of system issues. Our goal is to make the money sitting in our SB account work harder between the 10th and the 30th of every month. Now that we have the boring facts out of the way, here's the life hack to make more money. If you don't already have an account in State bank of India, get one immediately, for it is the only bank (that I know of at the time of writing this post) that makes this hack super simple and extremely convenient. Read further to know more. Okay, so, now you've gotten an account in SBI, assuming you've got your internet banking setup and are able to login, view transactions etc. and also your PAN associated with the account (this is mandatory for many transactions that you will need to do and be the good citizen and not evade tax), let's see how to make some extra money. This may not be a lot of money, but any money is good money and for a small effort from your side, it offers a lot of advantages. In case you have your salary being deposited in SBI already, good. If not, it's alright. We have the power of NEFT/IMPS. As soon as your salary gets credited to your account, using one of the two methods, transfer the money that you think you would owe the credit card company when the bill for the current cycle gets generated. You must have a fair idea of this. If not, you have bigger problems to worry about. 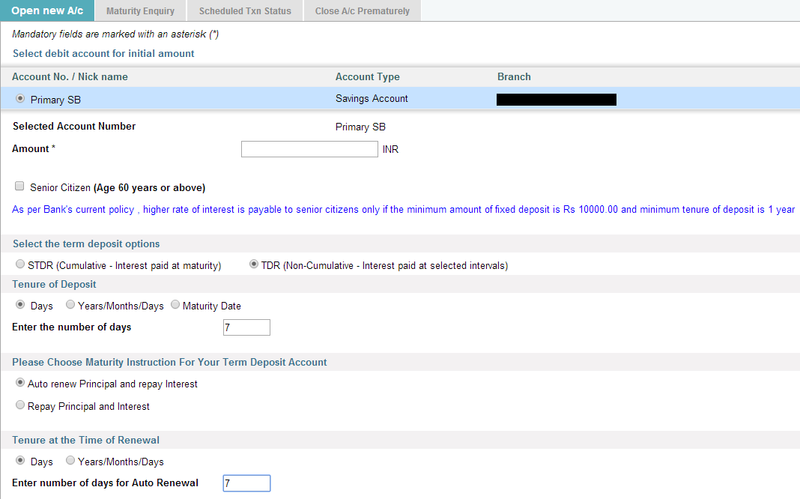 In our example, on the 1st of the month, I transfer the money (that I think would be the bill for this month) to the SBI account. NEFT/IMPS would charge me a service fee for this transfer. It doesn't matter. We'll be making much more money than this. I prefer IMPS because it is available 24x7 even on holidays and charges are similar to NEFT's. Now comes the best part. SBI offers a product called online term deposit (eTDR). We need to open this account using the money that we transferred. Now, the minimum duration of this account is 7 days. SBI is the only bank that offers this. All other banks offer much higher minimum durations and the interest rates are better than a regular SB account only for accounts greater than a year, which makes all other banks TDs unattractive for our purpose. So, open an eTDR account and choose 7 days as the duration. Choose "Autorenew principal and repay interest" option. It'll give you an option to choose the duration for reinvestment. Choose 7 days in that too. So, what this essentially does is that it credits the interest earned by this account to your SB account every 7 days and the original principal is reinvested for a further 7 days. What makes this very attractive is the fact that this account offers a 7.5% interest v/s a mere 4% that SB offers at the time of writing this post. The interest is credited immediately and not quarterly like in a regular SB account. Also, in a regular SB account, the interest is calculated on a daily balance basis, and hence if the amount is withdrawn in between, you lose the interest for those days. Since this is almost like a fixed deposit account, you can't take the money out without premature closure. And 3-4 days before your due date for credit card payment, you can close this account and the amount including the interest as on that day minus the penalty for pre-closure (only for the last 7-day cycle), is immediately credited to the SB account associated with this account. You can then pay off your credit card using this money. And if you are using HDFC card, use this link https://payments.billdesk.com/ubp/hdfc/ to pay the card directly from the SBI account and avoid any NEFT charges again to transfer to the HDFC account. Pro tip: If any of your friends owe you money and you have a HDFC credit card, you can ask them to use the link above to pay your card directly with the amount they owe instead of paying you cash. This will save them NEFT charges as well. Keep in mind that this interest earned is NOT tax-free. You will have to include all this interest earned when you calculate your taxable salary for the year and pay the tax on it according to the slab you fall under. Despite this, this is a good method to make your money work harder for you while still keeping it fairly liquid. So, that's how you make your credit card usage earn you real money! Leave a comment and let me know if you know of better ways that you've come across or implement yourself. Also, let me know if there are other banks that offer better interest rates with the same safety guarantee (in terms of trust) that SBI offers. Until next time... Happy investing!